We're delighted the flat season is finally beginning & it's great that the first fixture is back home at Doncaster & the tremendous Lincoln handicap rather than like in 2011 where the first turf fixture of the year was at Leicester. As well as the beginning of the UK flat racing season there is the world's richest horse race with the Dubai World Cup at Meydan & Kempton has some high class action on the all weather too. We've looked at the meetings & come up with some selections that should offer up some decent value. The Dubai World Cup sees Aidan O'Brien's So You Think as the current favourite but a European based trainer has never managed a winner in the race, unless you count Godolphin's Saeed Bin Suroor who is based in Dubai for half of the year, & there is good reason even without that statistic to think that odds of 5/2 offer no value at all. The ex-Antipodean champion picked up three Group One's last year but they were some of the weakest we've seen, winning one at 1/7 & another at 4/6, the other win in the Eclipse was decent but conditions far suited So You Think compared to 2010 Derby winner Workforce & he didn't real give that form a boost at all. So You Think then lost his next three, albeit in the very best races around, but maybe that showed his true level of form, a Group One performer but not an elite Group One winner & it tends to be top horses winning this race. We reckon that the Japanese horse Smart Falcon offers a much better bet at odds of 13/2 with Ladbrokes. The horse is a winning machine with 19 wins from 26 runs & horses from Japan have consistently proven they are right up with the top Europeans & jockey Yutaka Take could try & make all on his mount in a bid to emulate Victoire Pisa's success last year. Godolphin always have to be respected as Sheikh Mohamed loves to win this race that is his brainchild, Mahmood Al Zarooni trains their best chance in Capponi & his thrashing of good yardstick Silver Pond here last time warrants respect. Elesewhere on the Meydan card the best bet of the day looks to be in the first thoroughbred race of the day as Bin Suroor's African Story looks a horse on the upgrade & this acquisition that switched from Andre Fabre at the end of last year can take the Godolphin Mile & we reckon in some style too. 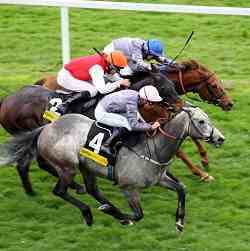 He gave some good rivals, including the reopposing 2nd Snaffy, a real beating last time & also won on his UAE debut. Although African Story lost the next time that was under the jockeyship of Mikael Barzalona & he's got Frankie Dettori on board today as he was for both of those wins. We really like the 2nd favourite Western Diplomat & backed him heavily in a couple of races at the backend of last season but African Story is a cut above & the current price of 7/4 surely won't be available come the time of the race. Back in the UK & we have to pick a selection for the flat season's traditional curtain raiser in the Lincoln Handicap, although we were surprised to see just three 4 year olds in the lineup considering the success that age group has achieved in the race. Trainer John Quinn has won the race before with Blythe Knight in 2006 & we like his Light From Mars, he won a 25 runner handicap off a mark of 2 pounds higher at Newbury on his seasonal debut last year & there has been some money for him here suggesting connections fancy a good run. Light From Mars disappointed in every race after that win last year but in a few races he either encountered unsuitable softish ground or raced over indequate distances & that has all helped his mark drop from a high of 101 back down to 95 & he can exploit that reduced mark at best odds of 14/1. The favourite Eton Forever is highly respected but odds of 6/1 are probably just on the skinny side & we're happy to stick with the bigger priced winner. Finally we come to Eshtibaak who we think can turn the Roseberry Handicap at Kempton into a procession, John Gosden is already in great form this year & could make it get better with a third win in a row from this unexposed sort. The son of Dalakhani made his debut last April, coming 5th, but didn't run again until smashing his maiden field in October & then made a very good comeback run last Friday by beating the useful Colour Guard pulling 7 lengths clear of the third. Chief rival here is William Haigh but we think that Alan Swinbank's gelding may have used up his handicap mark after winning 5 in a row & going from a mark of 70 to today's 95. At odds of 5/2 Eshtibaak can prove himself to be a Group horse in a handicap & slam these rivals, with the step up a furlong further to 1m 3f really suiting this galloping type. A £1 yankee with all of these winning would be paying over £2000!